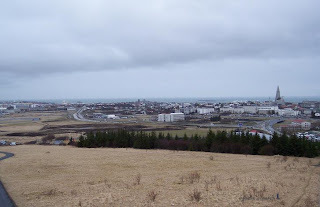 About two years ago I visited Iceland with a friend. 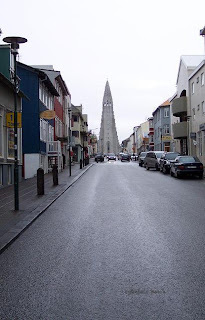 Or actually it was the capital Reykjavik that we visited. From there we made a few nice sight seeing trips. 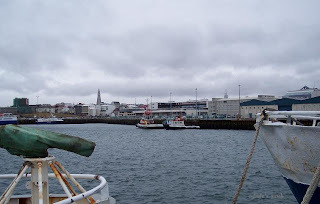 In the next couple of postings I'll show some pictures I took during our trip to Iceland. 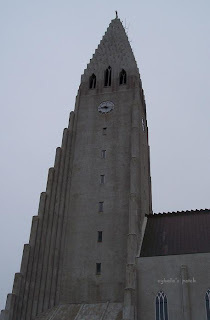 The Hallgrims church, build over several decades from 1945 to 1988. It is a massive building and I just couldn't get the whole church in front of my camera ;-) The church doubles as a concert hall. By the way: did you notice the wonderful skies? 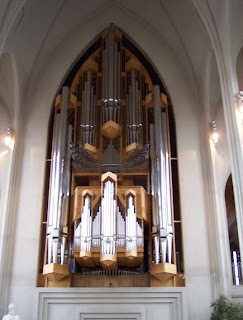 For more interesting pictures please click on the My World button in the left side bar. 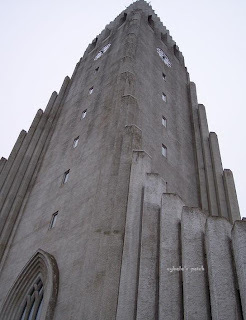 That's an interesting design for the church. Quite unique. The street is so clean and that church is an amazing structure. Wow! What a stunning church, different and very lovely! I was thinking the same thing about the street -- so wonderfully clean! Have a great week! Beautiful photos of the church architecture! Interesting that it is visible from so many angles. Wat een prachtige reis zal dat geweest zijn. Mooie foto's van het landschap en de kerk is schitterend. The church is not old, they began building it 1945, my mother lived near the place and she told me she remembered when they began, she was 7 yrs old then. I like the last photo. seems like a rocket launching. someday, i want to go to iceland. look very neat. what a lovely place! and the church is beautiful. I love its architectural design. Half pyramid, half church - wonderful building and most unusual. Lovely photos. really amazing structure and you captured it really well. thanks for sharing. fascinating architecture!! I love the "cascading effect" which they seem to have repeated inside too!